(Photo from left): Pakin Ploypicha, M.D. of Oasis Spa Thailand, Pinkaew Fagel, Wim Fagel, General Manager of Amari Rincome Hotel, Kwanchai Tanyaluck, Assistant Vice President Italthai Industrial Co.,Ltd., and Toby Allen, M.D. of Oasis Spa Thailand enjoy the evening at the Amari Rincome’s La Gritta Restaurant. The Amari Rincome’s La Gritta Restaurant was the setting on January 30 for a six-course wine dinner held to promote ItalThai, Cranswick Wines and the Reidel Glass Company. Over 100 guests of the hotel and local residents were tempted to attend, and all agreed that the 750 baht charge was well worth it! Upon arrival, guests were offered champagne or cocktails, with the dinner itself including, as the main entrée, a combination of Australian beef and lamb on raspberry essence accompanied by potato noodles with poppy seeds, an original combination. Dessert was mousse au chocolate, flavoured with coffee and almonds and served with kiwi coulis. Wines from the Cranswick vineyard accompanied the dinner, each chosen to compliment the courses. As a result of the success of the evening, repeats are planned every 4 months. All dressed up and a great place to go! Chiang Mai’s Ratilanna Boutique Hotel on the Ping River was the recent setting for an unusual and fun event - a ‘fancy-dress contest’ evening. Guests were requested to arrive dressed as whatever they fancied - and some very fancy dresses (and costumes) were the result! Ranging from a basket of fruit (the mind boggles), through the Count of Monte Cristo, a Burmese Prince, 3 different versions (and dress sizes) of Tina Turner, an angel from heaven (via Vienna), the Phantom of the Opera and an Indian Sultan, to different versions of traditional Lanna costume and the inevitable ‘Flower Power’ beautiful people, the variety was endless. A professional photographer had been engaged to take pictures of all the entries, which also ensured that no-one would be able to deny in future which character they represented! The Chiang Mai VIP community was well represented, with fashion designers Orth and Tananan Willson, Mom Luang Preeyapun of the Chiang Mai Ballet Academy, former TV star Kraysorn, Fashion King’s Frank, the director of Chiang Mai’s Chamber of Commerce, event organiser Waranon and Wuttipong, president of ThailandFreunde CM. A delicious buffet was provided, and the usual raffles were held, but the highlight of the evening was undoubtedly the judging of the costumes, which took place amongst a great deal of hilarity! 12 guests came forward to be judged - many favoured the Phantom of the Opera, but the prize and title of ‘Fancy Costume Superstar 2009’ ultimately went to the Burmese Prince, aka Waranon. A popular decision! The revelry continued into the night, with karaoke and other very loud and joyful musical treats. The friendliest centre in Chiang Mai for art, music, art classes and good nights out, ArtSpace on 7, hosted a free event – their second Singer/Songwriter night – on January 30. The evening featured acts by Matthew Whiston, Bradley Dean Whyte and Lindsay Stevenson. Original music had its first performance to a full house at the candlelit, New York cafe-inspired venue, and, for a special treat, Ty Olynyk, a very talented 7 year old guitar student at ArtSpace, helped to open Bradley’s set, confidently making his stage debut as he ‘duetted’ a Beatles’ tune. 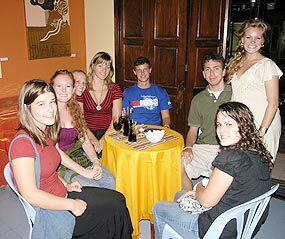 Melissa, Jenna, Abby, Candy, Zach, Den, Kelly (standing) and Sarah enjoying the Singer/Songwriter event at ArtSpace on 7. Bradley and Matthew also gave a sneak preview of songs on their upcoming collaborative CD, Geography of Hungry Ghosts, that will be released at another free event at ArtSpace on March 7. The duo’s many fans can look forward to a CD of delicately arranged and eclectic Americana-influenced pop music. Kelly spoke of her enthusiasm for the growing presence and appreciation of new art in Chiang Mai. ‘ArtSpace is special...it’s great to see the community supporting it. The venue attracts customers who want to be entertained, but who are also thoughtful and very alive.’ Kelly sat with a large group of friends, celebrating her farewell to Thailand after a six-month stay, and said that her favourite thing about Chiang Mai was exploring the side streets, a fascinating and lucky way to find a gem like ArtSpace. ArtSpace on 7 is located on Srimongalajahan Soi 7. Princess Dr. Chao Duangduan na Chiengmai opens the school’s annual festival. The Chiang Mai School for Dramatic Arts held its annual festival and exhibition on February 4, aimed at showcasing its students’ achievements over the past year. The festival focuses on fun – for the parents, the teachers, the school’s supporters, the visiting VIPs, the board members, and, first and foremost, for the students themselves! The event began at 8.30 a.m., with the sound of a huge drum being struck three times reverberating around the area, waking up any late sleepers and announcing to the visiting crowds the start of a great day. 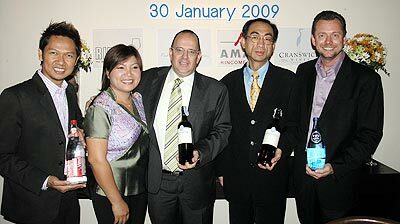 Two very colourful ‘chickens’ with Wuttipong Arayatumsopon (second right), president of Thailandfreunde e.V. CM, and members of his committee. Immediately the sound had died away, the MC for the day, a teacher at the school, introduced the guest of honour, Princess Dr. Chao Duangduan na Chiengmai, and requested her opening speech, during which Dr. Chao complimented the students and teachers on their many achievements in the past year. Dr. Chao’s irrepressible sense of humour captivated the audience and ensured a fine start to the day. Performances, ranging from traditional music, dance and songs from Lanna, Isaan, central Thailand and the south, through Broadway hits, to the classical compositions of Mozart and much more, were given to a delighted audience by students from all age groups, and comedy sketches were received with roars of laughter. A comprehensive exhibition of traditional Thai musical instruments and traditional costume from all over the kingdom attracted a great deal of attention, as did a fascinating display of clothes created by the students from recycled waste products. One comedy performance involved students dressed as rather large chickens, and evolved into a mix of a chicken fight, Muay Thai, acting, more boxing of the Western variety and a quantity of water. After lunch, everyone played games involving their knowledge of Lanna culture, and still more games, whose winners depended more on good luck than on knowledge. An amazing day, loved by everyone, and a great credit to the School for Dramatic Arts, its teachers, and, most of all, its students. Delicious strawberries at the Samoeng annual Strawberry Fair. 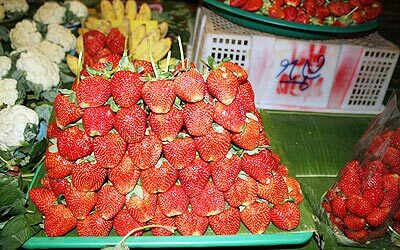 Samoeng’s annual Strawberry Fair will take place this year between February 13 and 15, according to an announcement made by the district’s chief, Sinchai Nakin, with the aim of promoting tourism, culture and the sale of local products. The fair will be held in front of the local District Office. Due to this beautiful area’s location at the foot of the mountains, it is perfect for growing the delicious fruit, with many varieties on offer, both fresh and processed. The Strawberry Fair will also feature a stage show, contests and a strong representation of the various local tribal cultures. Samoeng is located 23km to the west of Chiang Mai; the district’s motto is, ‘Delicious strawberries, high mountains, many flowers, a Swiss atmosphere and a self-sufficient economy’. Sounds well worth a visit! Prem Centre’s Organic Cooking Academy staff, together with students, parents and staff from the International School, recently participated in a special life-prolonging (sueb cha-ta) ceremony, to mark the Cooking Academy’s first anniversary. Cooking Academy staff, students and parents make merit at the academy’s first anniversary celebrations. The ceremony, held at the Cooking Academy’s sala, followed the Thai Buddhist tradition of making merit on auspicious days. Nine monks from Wat Wa Lu Ka Ram chanted blessings to honour the day, a year ago, when the academy began offering classes to students from around the world. During its first year, 1,200 students have undertaken cultural cooking classes as part of activities organized by Prem’s Visiting Schools Programme. Students learn how to select seasonal herbs and vegetables from Prem’s organic farm and go on to prepare a variety of authentic Thai recipes in the traditional manner. Lastly, observing Thai etiquette, they come together to enjoy their feast with fellow students. At the celebration, all present gave prayers for the continued success of the Prem community and for the Cooking Academy’s quest to preserve, teach and re-introduce the great traditions of Thai cuisine. Academy staff and parents prepared a delicious meal for over seventy guests, with students, staff and teachers alike joining happily in this traditional Thai event. There were smiles all around as participants heard the children’s shouts of joy as they were sprinkled with water blessed by the monks and flung out over the crowd. 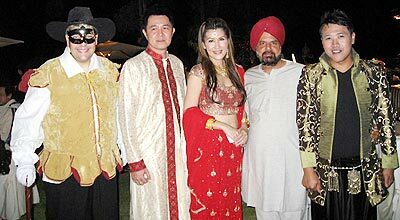 Guys & Dolls gather for their inaugural dinner at the Ratchamankha Hotel. ‘Guys & Dolls,’ the recently formed exclusive dining out group, held their first dinner event at the Rachamankha Hotel in the old city on February 3. Tables were set up in the hotel’s courtyard for the 23 diners, a lovely setting in one of Chiang Mai’s best known upmarket venues. ‘Guys & Dolls’ itself was founded by Sally Ward late last year, with the aim of bringing together a group of people who enjoy, and are able to afford in these difficult times, fine dining, thus experiencing the best foods and wines that Chiang Mai has to offer. 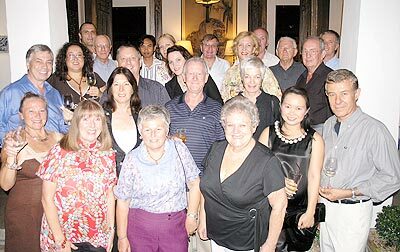 Sally is, of course, an expert on ‘deals,’ as a result the price of the group’s inaugural dinner was 680 baht net, with a special offer of wine at 700 baht per bottle. The food, as expected at the Rachamankha, was delicious, with the special menu, served ‘family style,’ comprising a choice of appetisers including vegetable samosas, spring rolls and mung bean crackers and main course choices of vegetable red curry, ruby fish sautéed with lemon grass, and chicken massaman curry, with potato patties served with jasmine rice. The dessert, berries baked in Cabernet Sauvignon with vanilla ice cream and a drizzle of honey was, according to the diners, ‘divine.’ Traditional Lanna music accompanied the dishes, adding to the romantic ambience, and the meal ended with a choice of tea or coffee. City kids of all nationalities will be on the Big Stage at the 1540-seat Kad Theatre on February 21, all with the aim of raising funds to help Chiang Mai’s rural children. In what is thought to be a ‘first’ for the city, caring students from Thai and international schools (the youngest aged six) will join together to perform ‘Small Wonders’, a major “Children helping Children” fund-raising variety show of song, dance, drama and instrumentals. All proceeds will be donated to rural children through the organisers, the Chiang Mai Charity Calendar. Guest celebrities are generously giving their time and skills, including performances from the internationally-known children’s magician Dr. Penguin, who will present the ‘Laughing Wizards’; Marty Le Gray, the world-famous juggler; Bruce Quinby, amazing hypnotist, and the award-winning musician Dr. Thorsten Wollmann with his Village Vanguard Jazz Trio accompanied by Dr. Pimonmas Wollmann. Before the performance there will be an exhibition of children’s art in the theatre’s foyer, with displays of arts and crafts for sale, together with a silent auction, open to the public, of the original paintings featured in the 2009 Chiang Mai Charity Calendar.